So here are a couple of the finished Custodes. The powerfist Sergeant doesn't have his banner yet, I'm still working on it. I kept the palette very simple and limited with my client's permission. Instead of the usual black primer, I got the go ahead to use a rich, dark brown. This brown is left in the recesses and blends in with the reds and golds on the model and doesn't darken/dull everything down as much as a black primer would have. The main wash for the model is Devlan Mud. It's dark enough that it adds some contrast to both the red tabards and the gold plating on his armour. On the metal areas, I added a small amount of Asurmen Blue to some Badab Black to give the metal a different look. Skin and purity seals got a wash of Ogryn Flesh. The base is grey with a lighter shade highlight. I chose grey because it contrasts against all the warm colors of the model and really sets it off I think. For the highlighting, I went back with the original gold and cleaned up the main aras and then added an overhead source highlight to the model with a much lighter gold. "I used two boxes of normal tactical marines for the bodies. I bought high elf spears that I shaved down and put bolters on to give me the gun/spears of the custodes; and high elf helmets that I cut off a little of the top so that the topknots would fit well. I then bought 20 ork boy top knots for the top of the helmets. Then used green stuff for the collars and the capes. I hope that helps, if you need any other information, let me know. I also had a "eagle" space marine captain shoulder pads that some of the custodes has. As well as one of the custodes seargents have a "eagle" backpack that I got from a space marine captain." They look quite awesome. The red and the gold go very well together and I agree the base colour is perfect. Very very, nice. They look great. Well done! I think the undercoat of brown really helped to keep the gold and brown colours strong. Will have to remember that! I am not normally a fan of the all gold models but you did a really good job on them they look good. So maybe i missed it but what are the banners going to be of? Very, very nice. 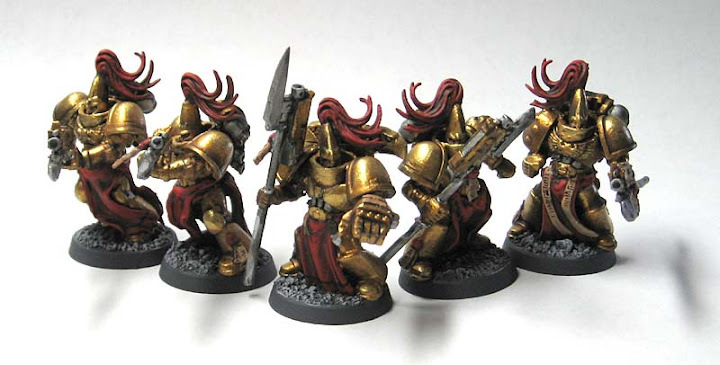 Sad that five ork boyz lost their hair squigs to give the Custodes their plumes, but sometimes sacrifices need to be made in the name of fashion. Very interesting tip on using brown to base coat before gold - I will have to try that sometime. I like those a lot. Very nice depth to the gold. Steve P.: I'm greenstuffing the banners instead of using cardstock to make them. I'm trying to up my game a little bit to keep up with everyone else. I'll have the results in a post later this week hopefully. Very nice models! I agree with the other commenters - the brown undercoat makes the gold look deeper and richer than if you had used the black undercoat. Very dynamic poses too. The brown was a big win for this project. It helped tremendously with keeping the colors rich and unifying the whole group. I emailed my friend and he sent me the list of bits he used in making these models (20 Custodes). It's been added at the bottom of the post as well. Very nice! Curse you though - you've made me want to take a stab at building a squad of custodes now. As if I didn't have enough projects as it is! I'd have never thought to start with a brown basecoat, the gold turned out gorgeous - that's a fantastic tip. Mordian7th: I always wanted to do a Custodes force but never got around to it... when this project came along, I practically jumped on it. It's been as much fun as I thought it would too.